It is quite common for people to want straighter teeth yet there is often confusion about the different types of braces that are on offer, what they can do and which one is best suited. People often make decisions based on brand-name and marketing and so we thought we’d write a blog post which explains simply and easily the various forms of orthodontics to enable you to make the best decision. The arguments between form and function exists in many things in life, dentistry is no different. Classically an orthodontist will want to achieve two things, firstly a beautiful smile which is straight and in-line. Secondly an arrangement between the teeth (known as the occlusion) which works in harmony with the jaw joint and muscles of the face, head and neck. Having a straight smile is cosmetically or form driven orthodontics, having teeth that work in harmony with each other and the surrounding anatomy is functionally driven. Most people are not aware of this functional aspect of their teeth, or rather, they are not always aware of the dysfunction, known as malocclusion. When an orthodontist looks into your mouth they will be aware of any dysfunctional arrangements between the teeth and will probably want to correct them. Cosmetic orthodontics does not seek to correct the dysfunctional arrangements between back teeth and it is the fact that we are now distinguishing between form and function which often allows us to have different forms of orthodontic treatment. Able to tackle the most complex of case. Completely flexible for the orthodontist. 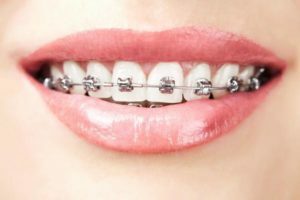 Because these braces can be used for a wide range of treatments including front teeth, back teeth, top and bottom plus they enable the orthodontist to move the tooth and root in exactly the direction they want, they are able to give an extremely predictable result. For this reason they are extremely popular amongst orthodontists as they actually serve the patient’s needs best in the long run by producing excellent results. They are however not always favoured by patients, especially patients in late teenage years or indeed adults. 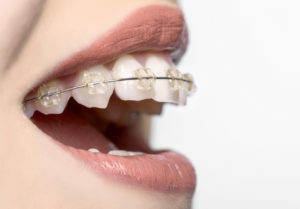 In more recent years tooth coloured orthodontic brackets and wires have been invented. These have proved to be extremely popular in adult orthodontics. 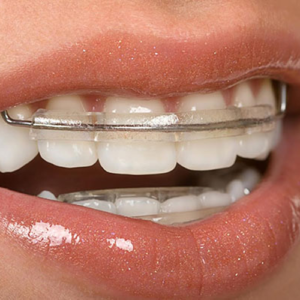 Generally speaking most orthodontists are able to substitute the metal braces for tooth coloured ones but there are a few clinical situations where this is not suitable, only a detailed consultation with your orthodontist will let you know whether your particular case can be suitable for this newer type of orthodontic brace. It has always been possible to move teeth rapidly but the technology and know-how didn’t exist up until a few years ago. The driver has been cosmetic dentistry which has meant that more people are looking to achieve a more cosmetic smile. As we have previously discussed there are two types of orthodontic treatment, those considering the form of your teeth and treatments considering both form and function. Rapid orthodontics generally only works with the form, in other words, it seeks to realign and rearrange the top and bottom front six teeth only. These have smaller root systems and the back teeth and are subsequently easier to move. You may notice that some of the treatments listed above also come under the tooth coloured orthodontics category, making them extremely versatile. The Inman aligner is a removable orthodontic brace which utilises a revolutionary new spring system which polls and pushes your teeth at the same time. This double action spring enables rapid movement of teeth, typically achieving results in 12-16 weeks, much faster than any other orthodontic system. The Inman aligner is removable orthodontic appliance which means that you can take it out to eat and to clean. You need to ensure that you wear your Inman aligner at least 20 hours per day. This is one of the most rapidly growing areas of orthodontic treatment. More more patients are seeking to have orthodontics without anyone else knowing. There are classically three ways of having invisible orthodontics. Tooth coloured/clear brackets and wires. Lingual orthodontics (brackets applied to the inside of your teeth. The most famous system for these clear aligners is Invisalign® (available from our dental practice in Southfields,. These clear orthodontic aligners work by placing a small amount of pressure onto your teeth to move them in the desired direction. Once your tooth is moved a tiny amount you replace the aligner with a new one, this process is repeated once every two weeks for approximately 18 months to 2 years. 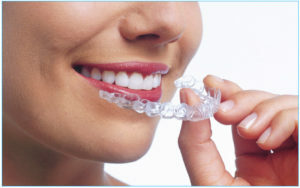 The Invisalign system works by taking a dental impression of your teeth which is then sent to the Invisalign centre where it is digitally scanned. Once your teeth being digitally scanned a skilled technician move the teeth digitally into their new position. This finalised, post treatment smile is then sent back to your dentist for review. You will then visit the dental practice to see this post treatment smile and approve it before going ahead. You will also be able to see an animation of your teeth by way of a digital simulation (Known as a Clincheck ™) which is an amazing innovation in digital dentistry. We’ve already discussed these in the fixed orthodontics section above, so we won’t go into any more detail here. 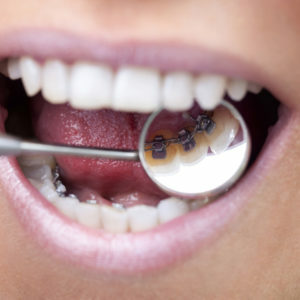 Lingual orthodontics can often be very tricky as they need to be exceptionally thin, custom-made for you and not interfere with the function of the way your teeth bite together. Not everyone is suitable for this type of orthodontic treatment for this reason. As you can see, it’s possible to have a full mouth of orthodontic brackets with no one else knowing that you’re having treatment. This makes lingual orthodontics particularly appealing to adults who don’t want anyone else to know they are having braces. This is the final section in our brief runthrough of the various orthodontic systems and treatmants available and is primarily concerned with treating jaw and to position problems during the growing stages of life. Further information about managing the teeth relationship in developing children can be found here. There are two primary orthopaedic treatment options. If treated early enough, the upper jaw can be expanded with a simple appliance over the course of a few months, correcting bite problems and giving more space for all the adult teeth to develop properly. Orthopaedic appliances can be used to bring the lower or upper jaw forward, putting the jaws in harmony with each other and the rest of the face. This is most effective at around the age of 8 – 9 years old although later treatment may also be successful. Mandibular (Lower Jaw) orthopaedics is carried out for the correction of a lower jaw which is too small resulting in the top teeth seeming like they stick out. For choice this type of treatment is carried out around 9-11 years of age, although older patients can also benefit if facial growth is still taking place. Patients of this age are generally much more amenable to treatment with removable appliances and tend to spend more time with parents than older children. This results in more conscientious use of the appliances, essential for effective progress. Younger children around 9 years of age are also growing proportionately at the same rate as they would do later on during their adolescent growth spurt. These two factors generally combine to allow for rapid progress to be made. As you can see there are a wide range of orthodontic options depending upon your overall objectives, age, speed which you want the treatment to take place and whether you are happy for other people to see your orthodontic appliance or not. At our dental practice in Southfields, Wimbledon we offer orthopaedic orthodontics for younger children, fixed orthodontics, Invisalign and the Inman aligner for almost invisible and rapid treatments respectively. We do hope you have found out orthodontic blog post to be useful and interesting, these feel free to share and comment.